The new Bishop of Derry, Bishop Donal McKeown, will mark his first public appearance in Desertegney this Sunday afternoon when he celebrates a special Mass to mark the 50th anniversary of the Star of the Sea church. 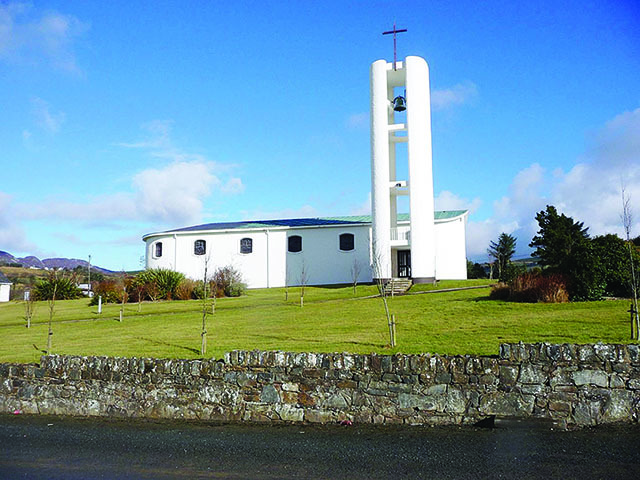 The iconic church in the parish of Buncrana, some five miles from the town, was officially opened for the first time on August 23, 1964 and to mark the occasion a small ceremony has been planned for this weekend. It was built for just £33,000 at the time, and completed in a little over nine months. This Sunday, August 24 a Mass will be celebrated by Bishop McKeown at 3pm with everyone welcome. Following the religious ceremony there will be refreshments and light entertainment in the nearby parish hall. The church at Desertegney sits on a grassy incline overlooking Lough Swilly, the inspiration for its nautical look. Designed by acclaimed Greencastle architect the late Liam McCormick, the church was designed in a boat-like shape with a coved west end, a peaked east gable and porthole like windows.